I found an absolutely brilliant google map hack the other day, called GMap Pedomoeter. 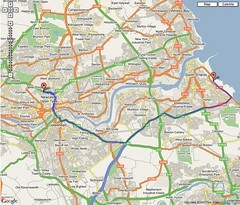 I allows you to track a route using Google Maps and tells you the distance etc as you go along. Its great for measuring out running routes, so I decided to measure out the route for the Great North Run, which I shall be running in a few months time.